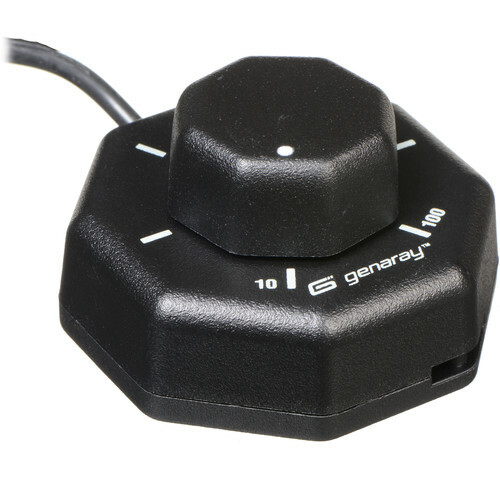 The Remote Dimmer for SpectroLED (120V/12V) from Genaray is a handy accessory that allows you to control the intensity of light from the SpectroLED 9 and 14 from 10-100%. It's great for controlling hanging fixtures or SpectroLEDs placed in tight spaces where you might not have access to the control panel. It's also ideal in a small studio for controlling several fixtures from camera position or other central location. The Remote Dimmer is compatible with both AC and DC power sources. Its 12.8' cable has a proprietary connector for the SpectroLED series. Box Dimensions (LxWxH) 5.9 x 5.2 x 2.1"
Remote Dimmer for SpectroLED (120V/12V) is rated 4.5 out of 5 by 4. Rated 4 out of 5 by Motolyric from Has it's Purpose Although there is a dimmer on the actual unit of t he SpectroLED this allows help when your LED light is raised higher than you or in a location remotely away from a distance to where you are not close enough. Prevents more actions than needed, so it's a must if you want to be efficient. 4 Stars because if it was wireless it would have been better but I can live with the wire for now. Rated 4 out of 5 by Matt E. from Remote dimmer, dims remotely. Super easy to use and can be useful in certain situations. It came in the Genaray bundle I purchased. I don't know if I would have gone out and bought the dimmers if they hadn't be included but if you know you'll need them they work great with the SpectroLEDS. Rated 5 out of 5 by Michael from Great addition for one-man crew I use this with the Genaray LED 3-light kit and it really comes in handy when I am working alone. Can a single remote control multiple Genaray lights? I'd like to have a pair of them in sync. Unfortunately, no, it cannot. The Genaray Remote Dimmer for SpectroLED is a wired remote and must connect to the remote input terminal on the rear of the Genaray SpectroLED-9 Light and Genaray SpectroLED-14 Light fixtures. As it is a wired remote, it can only be plugged into one light fixture at a time.